If he can haul in six more passes over the next two games, Andrew Beck will move into the top five in Texas football history for receptions in a single season by a tight end (photo courtesy of texassports.com). AUSTIN, Texas — No. 14 Texas heads to the Big 12 championship game Saturday against No. 6 Oklahoma in Arlington with a herd, if you will, of weapons: a record-setting quarterback, a trio of wide receivers who can compare with any in the nation, and even a rotation of three running backs, all of whom excel in different phases of the game. The one weapon the 'Horns hope Oklahoma overlooks is senior tight end Andrew Beck, who could end up being the difference in the game. In a game that likely will be decided by the Longhorns' ability to chew up the clock to keep the powerful OU offense off the field, short, drive-extending throws to Beck will be one of UT's bread-and-butter plays. A two-time captain, Beck has overcome three injuries in his career to the same foot and has returned this season to start all 12 games, hauling in a career-high 26 passes for 256 yards and two touchdowns while emerging as a threat down the seam on play-action passes. From 2014 through 2016, he started 15 times with 12 catches for 159 yards and two touchdowns, so it’s easy to say that Beck has enjoyed his most successful year on the 40 Acres. Last August, before the 2017 season started, Beck fractured his left foot during practice, but he still served as one of the team’s captains throughout the season. This summer, his teammates voted him to serve as a captain again. Beck was recruited by former Texas coach Mack Brown (he attended one of Brown’s camps on campus when he was young), and was signed by Charlie Strong out of Plant High School in Tampa, Fla., after he collected offers from 16 Div. I programs. Texas hasn’t had a consistent pass-catching threat at tight end since Jermichael Finley in 2007. If Beck can catch six more passes over the Longhorns’ final two games, he can move into the top five on the program’s list for receptions by a tight end in a single season. Despite the fact that Beck has received more and more chances as the season has progressed, Texas coach Tom Herman wouldn’t tip his hand when asked if he would try to target the tight end more against the Sooners. But then maybe Herman is playing his cards close to his vest ... and rightly so. Beck said he likes the way the Texas offense has evolved and has become more versatile as the season has progressed. Beck, a member of the Texas Cowboys (an honorary men's service organization at UT created in 1922 to serve the university and the surrounding commiunity) and one of the oldest players on the roster, has been named a semifinalist for the second annual Jason Witten Collegiate Man of the Year for having demonstrated a record of leadership and exhibiting exceptional courage, integrity and sportsmanship both on and off the field. 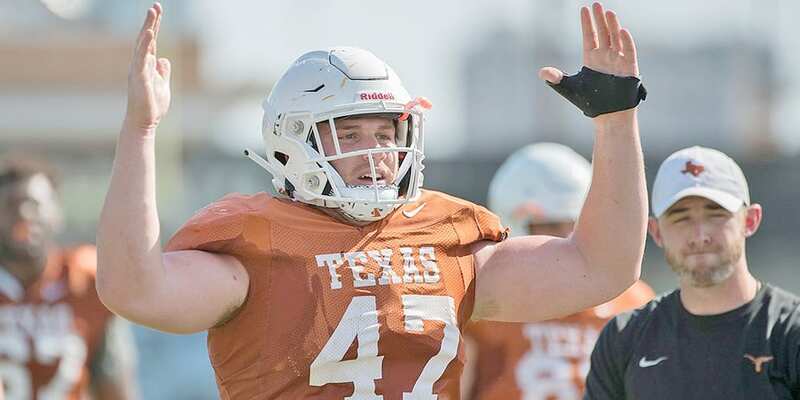 After injuring his foot during spring practices in 2017, Beck reinjured the same foot in a non-contact injury during August camp and missed the entire 2017 season, which would have been his senior year. Instead of calling it quits, Beck got surgery again, rehabilitated throughout the season, took a redshirt and returned for 2018. “(While) going through the process, my teammates were incredibly supportive the entire time, and I did not give them enough credit about them being a part of the reason for me wanting to come back,” Beck said. “They absolutely were a huge part of it.